In the mid-90’s, I was living away from home for the first time and becoming increasingly interested in making photographs. This was the decade I experimented with my parents honeymoon camera, a Voigtländer Perkeo I, which led to my first twin lens reflex a Minolta Autocord followed by my favorite camera, the Rolleiflex Automat TLR. In the past I have avoided talking gear for fear of betraying my camera nerdery. At some point in the 1990’s, maybe around 1997, I went over to my parents house. My mom was crocheting on the back porch which is a slab of concrete that is sheltered from the sun by the second story deck which overlooks Mission Bay. I had the Rolleiflex, a set of close-up lenses and a desire to photograph my mom’s hands, the yarn she used to crochet and the fabric of her dress. Six frames were dedicated to a close-up of her trying to teach me a pearl stitch. I don’t remember why the portrait session had turned into a knitting lesson. Maybe it was a strategy for me get permission to photograph her. More than likely, it was my attempt to photograph the steps of the pearl stitch so that I could try it on my own. Maybe it was the bachelor in me thinking that in the future I would need to crochet a pair of socks or a sweater. I must have grown impatient with the TLR and its parallax which made the framing of objects close to the camera an educated guess, for partway through the roll, I made two images of my mom from a converstational distance. Only two before going back to make four more attempts at recording the yarn on her lap. 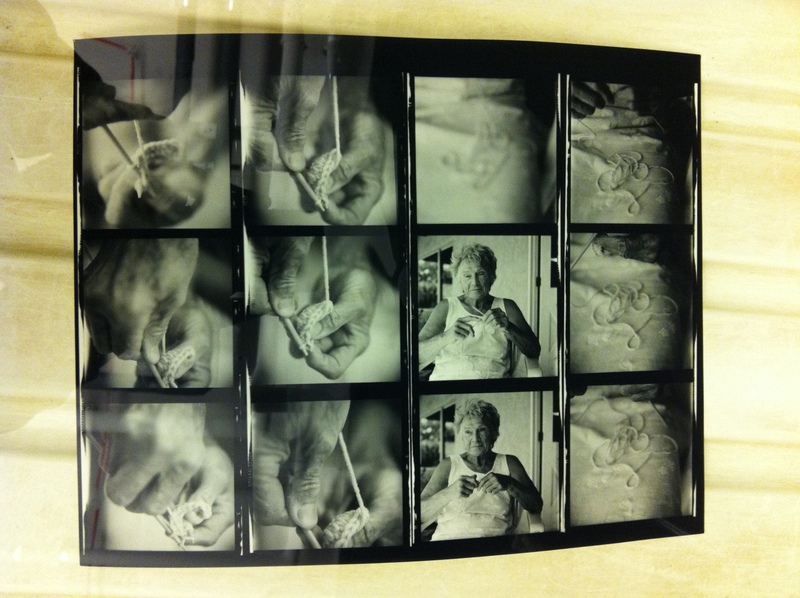 Only a contact sheet was made of the Crochet Lesson. I never made individual prints of her hands. Next month as part of an exhibition of portraits of parents, I am including a reprinted version of this contact sheet made on a paper I used to print with during the 1990’s, Oriental Seagull Variable Contrast Glossy (the one in the blue box with the purple sticker). My name is Francis Schanberger and I am a photo nerd.